The rapidly growing population of the West Linn-Wilsonville area is the motivating factor behind several capital projects the WL-WV School District Long Range Planning Committee (LRPC) hopes to see on a bond measure in either the November 2019 or May 2020 election. Over the past several months, the LRPC has examined 10-year demographic and enrollment projections and the district's recent high school study survey as well as considered community input from forums and surveys. The LRPC has planned seven capital projects, wwhich will cost an estimated total of $206.8 million, that could potentially be funded by a capital bond measure. "A bond of that amount would not raise the current tax rate for West Linn and Wilsonville residents, staying below the $3 per $1,000 threshold that residents currently pay," a district press release stated after the LRPC finalized the capital projects list Jan. 9. One prominent project on the LRPC's list is "Expanding opportunities and addressing capacity at the secondary level." Projections show that within the next 10 years, West Linn High School will grow beyond 2,000 students, about 250 over its capacity. By 2028, Wilsonville High School could have around 1,700 students, surging past the school's capacity by more than 200 students. To address this issue, the LRPC would like Arts and Technology High School to grow from 100 students to 500. To accommodate this growth, Arts and Technology High School would move from its current location, where its lease is set to expire in 2022, to the site of Athey Creek Middle School. Athey Creek would then be rebuilt on land already owned by the district on Dollar Street. 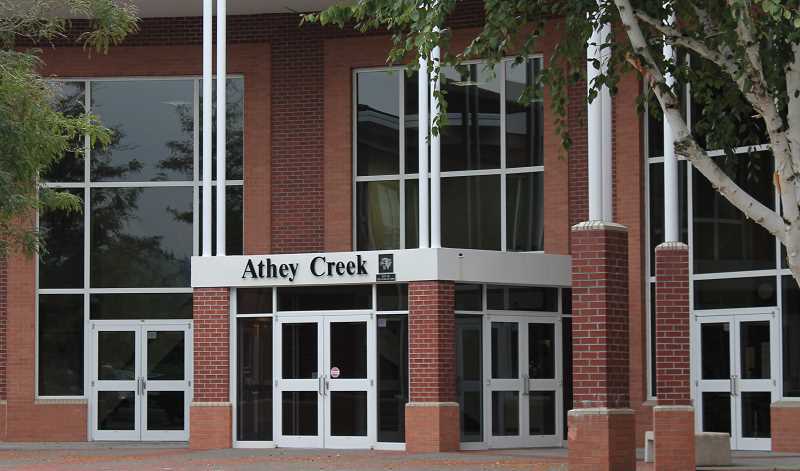 To convert Athey Creek into the new Arts and Technology High School and to completely rebuild Athey Creek would cost a total of $88 million. In response to growth at the primary level, the LRPC proposes building a brand new $39 million primary school. This new school would be built on the district's Frog Pond site. Initially it would hold about 350 students but allow room for future growth for up to 500 students. Boeckman Creek Primary is currently at its capacity and expected to be 250 students over capacity by 2028. A few other primaries are nearing capacity as well. The LRPC proposed increased access to the arts at Wilsonville High School by building a new drama area including a 600-seat theater and spaces for drama instruction and stage craft. The current theater at WHS was constructed under the 2014 capital bond and has around 200 seats. A larger theater would attract local arts groups to use the space. "Allowing community theater groups to use the space would be great for our students," Superintendent Kathy Ludwig said. "It would give some of our students more experience with adult actors, with more sophisticated actors, especially in the summer." Another project to potentially land on a bond measure is the expansion of the stadium and parking at West Linn High School. To expand the WLHS's south parking lot by 120 spaces alone would cost $3.5 million. The LRPC also recommends expanding the stadium at WLHS, which overflows for every home football game. The plan would create more covered seating on the home side of the stadium as well as more seats on the visitors' side. In total, the expansion would add 1,000 new seats. Expanding the stadium as well as the parking lot adds an estimated $4.8 million to the project cost. A plan to make all district schools more secure and welcoming would cost an estimated $4.5 million, according to the LRPC. To improve safety and security at schools, the LRPC would like to secure all school entrances, provide all classrooms with lock down hardware, install intrusion limiting glass (glass that is very difficult to break through no matter what type or how much force is applied to it) at strategic points in all schools and add shelter-in-place curtains to all classrooms. Shelter-in-place curtains can fold up in classroom corners when they're not being used but expand out behind windows and doors as an extra barrier. The LRPC also proposes a "learning with technology" project which would update and improve a number of technologies throughout the district as well as technologically enhance students' education. Among the technological advances in this project are: Wi-Fi upgrades, rewiring of schools, a district-wide distributed digital signal, video monitoring, a new student info system, WAN (County-owned fiber network that allows for the transmission of telephone, internet and cable signals) and laptops, tablets or other devices for students to use in school and at home. "Every bond we've had in the past has had a section devoted to technology," Operations Director Tim Woodley said. "Technology is one of the hallmarks of our district. It is very important to our students' education." Finally, the LRPC proposes a "district-wide improvements" project for $24 million. Some of these improvements include installing air conditioning at Cedaroak Park, Stafford, Bolton and Willamette primary schools, building greenhouses at all district middle schools, a wet lab and classroom addition at CREST, kitchen equipment replacements and fire alarm and fire sprinkler upgrades and replacements. The LRPC presented these projects to the school board for the first time Monday, Jan. 14. On Jan. 28, at the school board work session, the board will bring their questions about the projects to the LRPC. The board will share those opinions at a bond summit meeting in late February or early March. While the board has not made any decisions yet, "Right now it's looking like the board will go out for a bond," Kilstrom said. If the school board chooses to go for a bond, it will decide in late spring which projects will make it on the bond measure for either Nov. 2019 or spring of 2020.